A wide range of consumer electronic devices are migrating to USB-C interfaces to support rapidly advancing communication and battery-charging capabilities, as well as smaller design size. In current designs, the host microprocessor is needed to detect the current level and configure the charger's input current limit. While PCs, laptops and cell phones have driven early adoption, USB-C adoption rates are expected to grow at 8.5 percent a year through 2020 thanks to usage in other classes of portable devices, according to IDTechEx. To reduce design size as well as simplify the system hardware and software design, the MAX77860 integrates USB-C configuration channel (CC) port detection and a battery charger for 15W applications. These integrated functions allow battery charging at the fastest rate possible under the USB-C specification and contribute to 30 percent smaller design size while also simplifying software development. 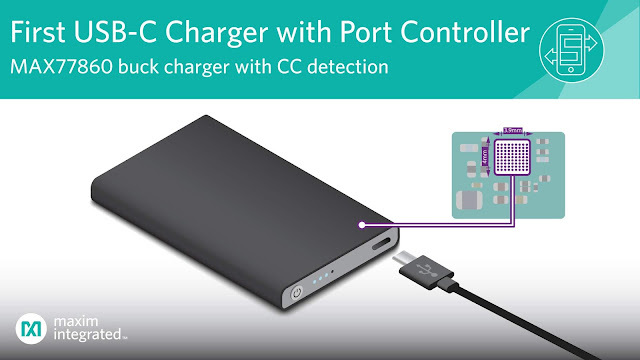 The CC pin detection feature also shortens the design effort by eliminating the need to support end-to-end USB port connection and allowing charging to start automatically. Highly Integrated: Eliminates a separate port controller and many discrete components. Reduces the size of an inductor and a capacitor due to a high switching frequency of 2MHz/4MHz, resulting in a solution size that is 30 percent smaller than the closest competitive device. This high level of integration also reduces overall BOM costs. High Efficiency: High-efficiency buck reduces heat dissipation with more than 93 percent efficiency and up to 3A charging capability. Design Flexibility: Backward compatibility allows designs to work with both USB-C and legacy BC1.2 or proprietary adapters. Integrated analog-to-digital converter (ADC) frees up resources in the microcontroller, while providing accurate voltage and current measurements. "The new MAX77860 from Maxim provides real advantages to design engineers working in the growing internet of things market," said Kimberly Majkowski, global product manager, Power Management ICs at Premier Farnell. "It reduces cost and design time while delivering super-fast battery-charging capabilities demanded by today's consumers." "The MAX77860 dramatically reduces system complexity by integrating the charger, the power path, the low-dropout regulator, the ADC and the USB-C CC detection in a small 3.9mm x 4.0mm package," said Perry Tsao, executive director, Mobile Solutions Business Unit at Maxim Integrated. "This level of integration simplifies the design, enabling the delivery of more power and more functionality in minimal printed circuit board space."